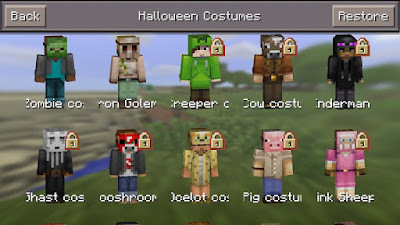 Be sure to download this awesome Halloween skin pack! It is worth the one dollar. I will give it a 4 1/2 star rating, because while they hads many mobs, they didn't always have the person underneath that matches me. For example, the ocelot costume skin I wanted is worn by a girl. But if you are wearing it just for the sake of the costume, go ahead and buy it!